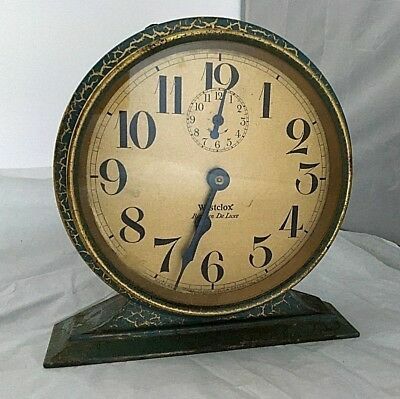 ANTIQUE Edwardian WESTCLOX BIG BEN DELUXE rare crackle effect alarm clock 6"
Sold EUR 80,96 Buy It Now or Best Offer, EUR 13,62 Shipping, 30-Day Returns, Pay with PayPal and you're fully protected. Popularity - 101 views, 3.4 views per day, 30 days on eBay. Very high amount of views. 1 sold, 0 available. 101 views, 3.4 views per day, 30 days on eBay. Very high amount of views. 1 sold, 0 available. Seller - 9.335+ items sold. 0% negative feedback. Top-Rated Seller! Ships on time with tracking, 0 problems with past sales. 9.335+ items sold. 0% negative feedback. Top-Rated Seller! Ships on time with tracking, 0 problems with past sales.